Individuals who struggle with periodontal disease often experience bone and tooth loss. Periodontal or gum disease is a chronic bacterial infection of the gums, that when left untreated affects the supporting bone. Replacing missing teeth is essential to your overall health and the health of the surrounding teeth. Unreplaced teeth can cause a number of complications such as causing the adjacent teeth to shift, become crowded, or eventually fall out. If you suffer with missing or loose teeth because of periodontal disease, dental implants is a fixed solution that can help restore your smile as well as your oral health. 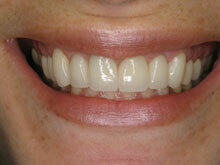 Dental implants are the preferred treatment method that provide a natural-looking restoration. Dental implants are a durable and stable solution for replacing missing teeth. 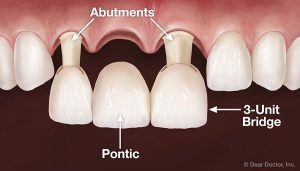 They act as an artificial tooth root and are composed of three parts: the implant, the abutment, and the crown restoration. The implant is inserted into the jaw bone and integrates with the natural bone, providing a reliable foundation for porcelain crowns and other restorations. Since dental implants integrate with the natural bone, they are the only restoration solution that prevents jaw bone deterioration and collapse. The process of integration between the implant and bone is known as osseointegration. Can I Get Dental Implants with Periodontal Disease? In order to be a good candidate for dental implants, there must be healthy bone and gum tissue to support the dental implant. Most patients who have suffered with periodontal disease believe they are not fit for dental implants, however, that is not always the case. Individuals who suffer with periodontal disease or have suffered with it in the past can receive implants as long as there is ample bone density and gum tissue to support them. A patient with periodontal disease who wishes to replace missing teeth with dental implants must first seek treatment to ensure the gum tissue, teeth, and bone are healthy. Once the infection is treated and under control, our specialists will evaluate the gum tissue and bone density to determine if dental implants can be inserted. If there is an insufficient amount of bone or gum tissue, bone grafting or gum grafting may be recommended to ensure there is enough support for the dental implants. There are many restorative options involved when utilizing dental implants to replace missing teeth. Single tooth replacement. 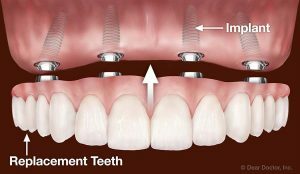 When one tooth is missing, a single implant is inserted into the empty socket to replace the root of that tooth. Multiple teeth replacement. 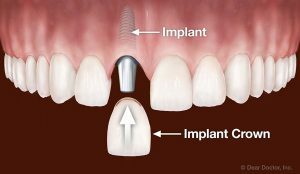 When one or more teeth are missing, you do not need to insert an implant for every missing tooth. Instead, implants can act as a support or fixed bridge work. Replacing all teeth. 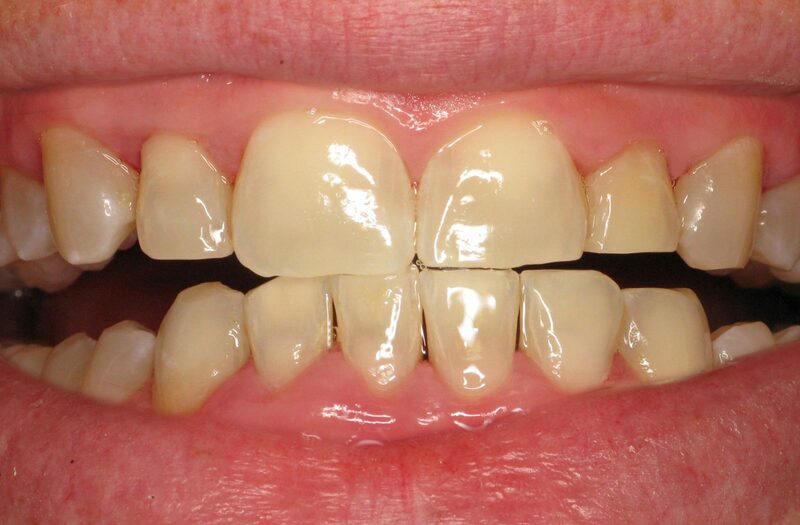 Implants can support an entire arch of upper or lower replacement teeth that are fixed into mouth. This is known as the All-On-4™ procedure. 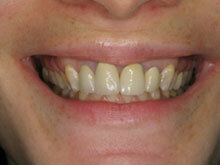 This procedure involves attaching a fixed arch of replacement on just 4 dental implants. Once the area affected by periodontal disease is treated, the gums will attach to the dental implants and heal properly. Therefore, it is important to maintain healthy oral hygiene. There are instances where the periodontal infection may develop again surrounding the implant below the gumline. The bacteria, if not treated early, can cause the bone that supports the implant to deteriorate; this is known as peri-implant disease. Proper maintenance of the dental implants include normal brushing and flossing, which will help prevent any recurrence of periodontal disease. When taken good care of, dental implants are very durable and allow the gum tissue and bone to integrate and develop successfully and healthy. Prevents bone loss. The implant inserted into the jaw bone integrates with the natural bone and helps maintain the structure. Keeps adjacent teeth stable. 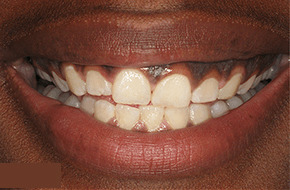 When a gap is left opened, the adjacent teeth tend to shift towards the open space. This alters the alignment and affects your bite, ability to chew, and appearance. Help prevent periodontal disease. 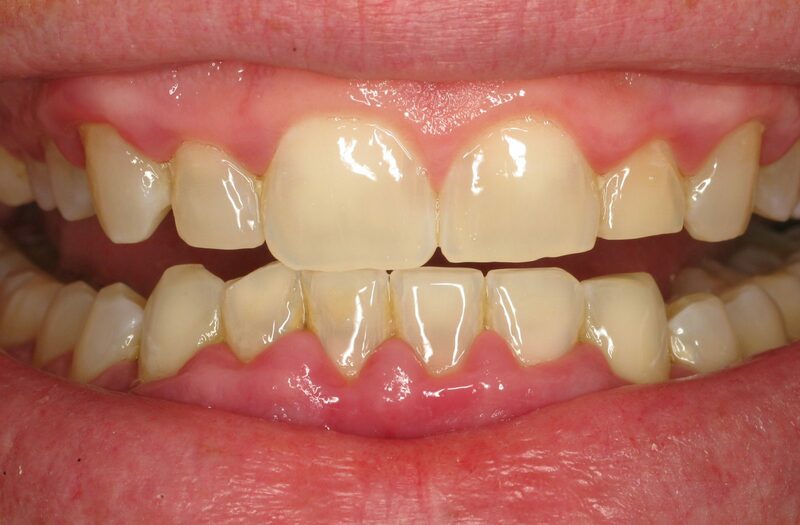 Having missing teeth and gaps can trap bacteria that can lead to periodontal disease. Replacing those teeth with dental implants can help maintain a healthy smile. Prevents facial collapse. Facial collapse occurs when the bone begins to deteriorate. However, since the dental implant integrates with the natural bone and helps regenerate bone growth, facial collapse will not occur. If you are interested in dental implants to restore your smile, consult with one of our elite specialists. 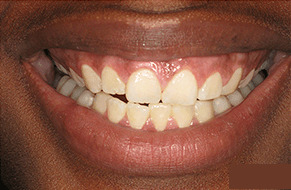 We will provide you with an unmatched care package that includes the following: treatment options, real patient case studies with before and after photographs of their treatment, instructions on how to maintain oral hygiene, our office policies and patient forms, and procedures completed from beginning to end within our office – in just one visit!